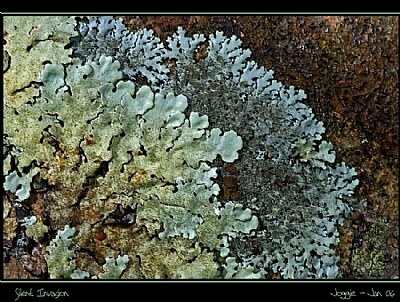 Image Title: Silent invasion . .
About Lichen growth on a forest tree. No cropping with limited enhancement of contrast, brightness and sharpening in PS. Used the Nikon SB-R200 flash system with one flash held at almost 90 degree angle to accentuate the texture. congratulations dear Joggie!!! made front page again!!!!!!! Thanks Guilio - much appreciated. wow, l'anteprima non rende onore ad una foto del genere: si capisce che ha una bella scala cromatica, ma fino a che non si apre non ci si immagina quale sia il livello del dettaglio. un piacere per gli occhi..
That's really interesting Joggie. they must be very sensitive to be used for monitoring air quality. Good use. Thanks for the info. Thanks Ann, what is interesting is that the biggest living organism happens to be a fungus and some of the oldest are estimated to be lichens. They are also excellent indicators to air pollution and are used for monitoring air quality. Thanks Guiseppe, firstly for your valid comment and secondly congratulations with you featuring as critique of the day. The three dimensionality that you refer to is exactly what I tried to accomplish here. I was using the built-in flash and the ringflash for most of my uploads until now. One of the problems with both is the unidirectional quality of the light, often resulting in a flat image, especially with subjects like this one where you cannot separate the subject from the background through selective focusing - the subject becomes the background too. The Nikon SB-R200 close-up flash system allowed me to put one of the two small flash units at an angle to create some soft shadows and the three dimensions you noticed. Not yet where I would want it - I was alone and would have liked somebody to hold a reflector on the other side to soften it up just a little bit. I am currently testing the system for a review article for Nikon (South Africa) and are still new with the system. Hope to improve it in future. Thanks again for your keen interest and helpful comments. Oh how unusual. Before I read your desription I was sure this was underwater coral. It has similar elements to coral. Anyway it is indeed a silent invasion as it appears to be creeping ever forth toward the tree in layers. Wonderful patterns and great contrasting colours. I really do enjoy your work Joggie. Also congratulations for making the front page critique today. Sometimes the title makes the picture. But your pick has more merits: colours, composition, the usual clearness and a tridimensional feeling that comes, I suppose, from the three levels composition an the stark contrast of dark outlines and highlights on the "leaves". Is that right? Very well seen and captured, great colours, good sharpness.